Abstract: ‘Toby’, a geriatric miniature poodle, was evaluated and treated for lumbosacral stenosis, pelvic limb lameness, neck pain and back pain with a combination of acupuncture, medical therapy and at home massage. 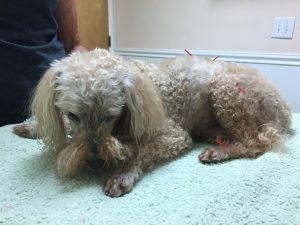 Toby responded very favorably over a course of four acupuncture treatments, resulting in improvement in his proprioceptive deficits, reduction in pain and improved quality of life. History and Presentation: ‘Toby’ is a 15-year-old male neutered miniature poodle. He presented on 7/22/17 for shaking and walking abnormally that had been going on for 5 days duration. He was on gabapentin and meloxicam at the time of presentation. He has a history of cervical spinal surgery in 2014, the result of a herniated disk according to the owner. He recovered well after surgery and had since been on daily meloxicam. He had more recently been started on gabapentin in January 2017 after having an acute episode of neck pain without neurologic deficits. Other relevant medical history for Toby is that he is blind due to progressive retinal atrophy and microcornea. He is also deaf. I saw Toby on 7/26/17 for a re-check and initial acupuncture exam and treatment. The owners reported he seemed a little more comfortable but still abnormal. He had quite marked ataxia of pelvic limbs (thoracic limbs normal) with sluggish but present proprioceptive deficits in both pelvic limbs, though the left rear leg was worse than the right rear leg. On myofascial examination, he had sensitivity in the paraspinal muscles in the caudal thoracic and cranial lumbar region. He also had caudal cervical trigger points bilaterally as well as in his quadriceps muscle groups bilaterally. Differential Diagnoses: Intervertebral disk disease (thoracolumbar +/- cervical), trauma, thromboembolic embolism, neoplasia, diskospondilitis. Definitive Diagnoses: Degenerative lumbosacral stenosis, historical cervical intervertebral disk disease with cervical myofascial dysfunction. I arrived at these diagnoses in combination of diagnostics (radiographs – see next section) as well as myofascial and neurological examination. During the treatments on 7/26 and 8/2, I was focusing on the back pain and distal pelvic limb points, as well as his cervical trigger points and reducing sympathetic tone. By stimulating the digital and deep fibular nerves with Bafeng and LR 3 I hoped to increase afferent input to return sensation. Stimulating the tibial nerve via BL 40 was helpful as a master point of the lower back as well as again increasing afferent input. My treatment of a variety of thoracolumbar inner bladder line points and their associated spinal nerves were meant to provide analgesia by eliminating trigger points and reduce facilitated pain transmission. In treating a variety of neck and cervical trigger points I was addressing myofascial abnormalities that were likely chronic in nature, as well as reducing facilitated pain transmission. All of my treatments have been limited to dry needling and some massage at the end, which I also instructed the owner on, and she performed at home. After his treatment on 8/2, the owners reported that Toby became quite uncomfortable in his left pelvic limb that persisted until recheck on 8/9. 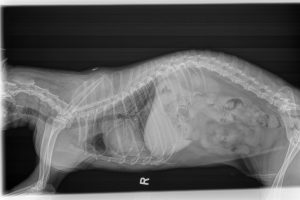 Prior to treatment on 8/9, the owners authorized radiographs of Toby’s spine and pelvic limb (I palpated extremely taut quadriceps muscles). The radiographs revealed marked lumbosacral (LS) degenerative disease with stenosis. With this finding, I was able to focus on the LS points and trigger points in the quadriceps. Following treatment on 8/9, the owners reported that Toby’s left pelvic limb lameness was markedly improved. At most recent treatment on 8/24, the owners are very happy with Toby’s progress. He rarely favors the left pelvic limb, does have persistent kyphosis and mild CP deficits in his left pelvic limb but is able to spend time outside with the owner and generally feeling quite well. Outcomes, Discussions, and References: Toby has multifocal spinal disease, including the cervical, thoracolumbar and lumbosacral regions. Through progression of his treatment, his neurologic deficits and clinical signs varied, but his primary issue causing his current clinical signs was his lumbosacral stenosis (though his cervical disease was contributing to his clinical signs at his initial examination on 7/22). As I was able to return sensation and nerve function to his pelvic limbs (as shown through improved CP’s and ambulation), his left pelvic limb became more painful which I believe to be due to impingement on nerve roots exiting from the lumbosacral foramina. This impingement initially caused reduced sensation but then progressed to neuropathic pain as sensation returned. By altering my treatment appropriate to his examination, I was also able to treat myofascial dysfunction and relieve pain secondary to the nerve root impingement. Although not the same condition, ‘sciatica’ shares some common pathology as lumbosacral stenosis in that nerve roots can be compressed as they exit the vertebral foramina. In a meta-analysis study on acupuncture treatment for sciatica, acupuncture was found to be more effective in treating the symptoms and associated pain of sciatica than conventional Western medicine1. As I continue in practice, I am recognizing lumbosacral degenerative disease quite frequently, and plan to utilize acupuncture in treating this condition. 1. Ji M, Wang X, Chen M, Shen Y, Zhang X, Yang J. “The Efficacy of Acupuncture for the Treatment of Sciatica: A Systemic Review and Meta-Analysis.” Evid Based Complement Alternat Med. Epub 2015 Sep 6. doi: 10.1155/2015/192808.